Second post in a series of parenting tips.... All starting with the letter "C". Last week we talked about Choices, and the importance of giving our children choices. Today we are going to talk about Commitment. What does it mean to commit. Commitment means to engage oneself, and to be involved. When our kids are acting out, our thought isn't usually to be more involved with them. We usually want to NOT be engaged with them. It is natural to think this way. When our kids are misbehaving, we aren't thinking, "...go get Candy Land, I would love to play a few games", or "...everyone in the car, let's go to the park.". When they are misbehaving we are not thinking about how much we want to listen to them. But...we should. 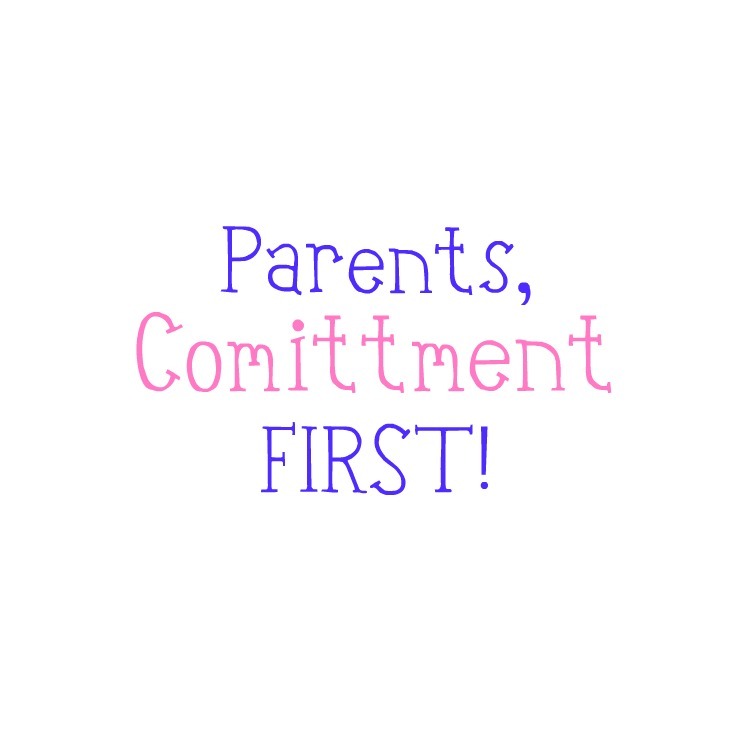 If we want the misbehavior to stop, and our relationships to strengthen, then we as parents need to make a commitment... FIRST! Yep, instead of waiting for our kids to be better, we need to commit to them first. This is how commitment works. 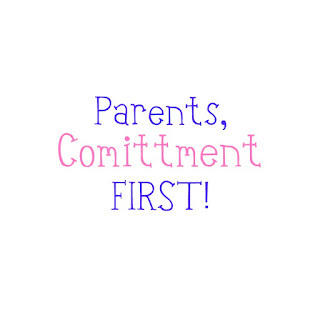 As parents, we show commitment to our children FIRST. Then, and only AFTER we have shown them our commitment, they will be willing to commit back to us as parents. They are willing to trust us, to behave, to listen, to compromise, to obey. Think about it, aren't we the same way as adults? When people don't give us their time, or energy, when they don't commit and contribute to our friendship or relationships, do we feel the need to serve them, or commit to them and the relationship? Nope, we don't. Once we commit to our children, they will commit back to us as parents, and to the family. How Do Our Children Understand Commitment? Each of our children will interpret our commitment differently. Our son feels commitment from me when I LISTEN. Really listen. This means that when he wants to tell me a story, or about a new invention, I STOP what I am doing, and listen. He knows I am committed to him when I sit at eye level and look into his eyes while he is talking. Our daughter is totally different. She feels commitment from me when I DO things with her. When we play, read, go for walks, go to the park, when I go to her activities, go...go...go... That is when she feels I have committed to her. When I am active with her. They are totally different in their feelings... BUT their behavior when they don't feel my commitment is the same. They don't want to focus on their homework, they complain, they drag their feet about household work, and have less patience when I ask them to help. They get bossy, have bad attitudes, and there is a lot of complaining and tattle tailing. Sound familiar? When they don't feel my commitment to them, they don't feel the need to contribute to our relationship either. A.K.A, they misbehave. Determine how your children feel commitment. Is it when you play with them, listen to them, take them places? Is it when you show affection to them, or let them choose, or give them freedom to explore? Figure out what they need to feel your commitment to them. Plan of Attack. Once you determine how your children feel commitment, create a plan of action. This will not be a cookie cutter technique. Each child is different. Write down your child's name, then how they feel commitment. Next, write down 5 ways you can show that commitment in 15 minutes or less. Lastly, write down 5 ways you can show that commitment in longer activities (over an hour). SO... next to our daughter's name I have written: color with her, play school (she is the teacher) walk around the block, jump rope in the garage, browse through her American Girl Doll Catalogues with her. For her longer activities, go to the park, go to the library, go to the indoor track, walk to the temple, paint. We need to take responsibility for their misbehavior. Hard to accept, but we could be provoking their misbehavior, by not showing them our commitment. It happens. It's okay. But instead of sitting back and pointing fingers, let's put the housework down and be the change we are looking for. Our kids know best. It is natural to want to show our kids commitment in our way, not theirs. Avoid this. It is not about us. It is about what they need. Even if we don't understand, give them what they need and want. I can try to convince our daughter all day that talking to one another is commitment. At the end of the day, because it wasn't more active, she will still feel dissatisfied. Let go of the perfection mentality. If we wait for the perfect time and situation to be with our children, we will never be with them. It will never be perfect. Stop waiting and act. Be in the moment. I doubt any of our children would say they feel our commitment when we multitask. Put everything down and commit your time, thoughts, actions, and heart, to your children. Commit to 15 minutes a day. Remember this post on one-on-one time? Now is the time. Make the decision to commit to your child every day. Give them you. That is what they want more than anything. Isn't good behavior worth 15 minutes a day? Twice a month, participate in a longer activity with your child. We have said it before, Love is spelled T-I-M-E. Want to see improvement in your children's behavior? Commit to them FIRST! By being engaged and getting involved. Then watch the behavior transform. How do your children feel commitment? Such a good post, Heather! A good friend told me of great parenting mantra--help me to close my mouth and open my arms. It is the hardest thing to do when I'm angry with my kids for their misbehavior but really, it's love they need and want. I am off to find the post you wrote about lying. I need a refresher on dealing with that. You always seem to address just what I need when I need it! My 5 year old has been very VERY whiny lately and ornery and his talking back has increased. I was just telling my husband that he must need something from us that his behavior has been changing. It is so hard with 2 other little ones at home, but worth the effort. Thanks for the nudge.